Tablets are a natural home for point-and-click adventure games, both because of the multitouch interface and because the 30-somethings who buy tablets are, for the most part, a nostalgic bunch. Early in the cycle you had ports of classics like Beneath a Steel Sky and The Secret of Monkey Island; then, more and more, you started to see originals--adventure games designed for tablets from the ground-up. Lost Echo is one such game, a memorable and melancholic journey that is short, sweet and stylish. As the game begins, you find yourself in an outdoor cafe with your girlfriend Chloe, a well-known journalist. She says she has something important to tell you, but a phone call interrupts. Just then you see a surge of blinding light. You black out and wake later in the hospital. Your friend Greg visits you, but when you ask about Chloe, he claims not to know who you are talking about. No one does, in fact. The doctor wonders if you have sustained brain damage, but you feel just fine--you just need to find out what happened to Chloe. Your quest follows the standard adventure game format: you explore, have conversations and solve puzzles--some of which are brain teasers and others of which depend upon your having scoured every corner of every environment to find the right items (the usefulness of which may not have been evident at the time). The puzzles aren't particularly great, but they're good enough. It does, however, help that the touch interface is so well done; you can really tell this was designed for tablets and not ported from PC or console. 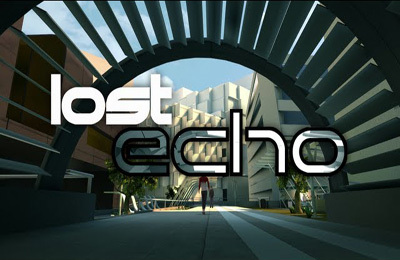 What really makes Lost Echo stand out, though, is its engaging, science fiction story, its tight focus on character and (gasp) character development--such a rarity in the world of video games. A beautiful soundtrack centered on Eric Satie's "Gymnopedie" gives the game an appealing and memorable air of melancholy--also a rarity in the world of video games. Overall, Lost Echo is an excellent choice for tablet gamers, adventure game enthusiasts and those who like the idea of an interactive story. Bonuses: + for emphasis on character and emotionally resonant storytelling; +1 for visual and auditory style. Penalties: -1 for some of the puzzles feeling a bit too random. POSTED BY: The G, purveyor of nerdliness, genre fanatic and Nerds of a Feather founder/administrator.